This course closed for major renovation until further notice. Every golfer dreams of the perfect landscape to play, and there is no doubt that the physical characteristics of the Nirwana Bali Golf Course are just that. 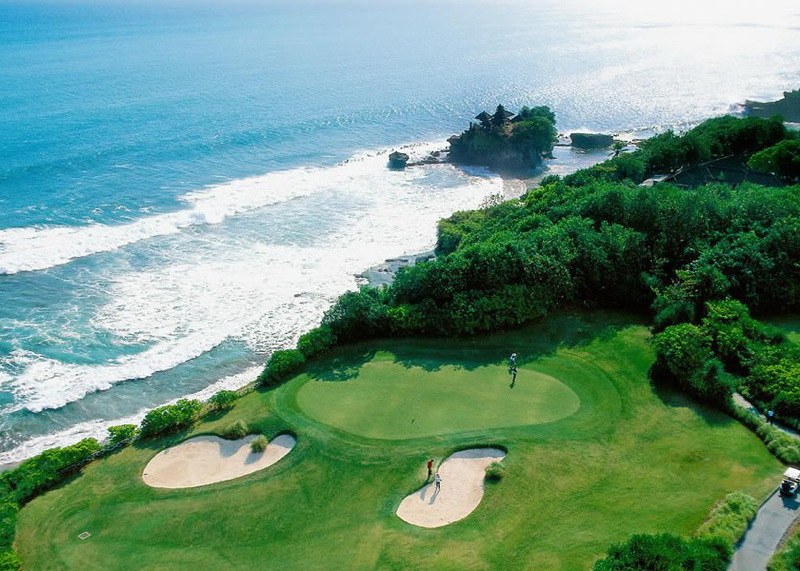 Lying on Bali&apos;s southwest coastline at Tanah Lot, Nirwana Bali Golf Club designed by Greg Norman and opened in July 1997. 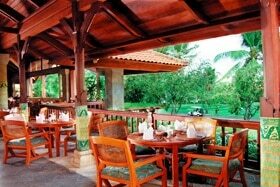 The course is a 30 minute scenic drive from Kuta Beach, the Bali airport, and the capital city of Denpasar. 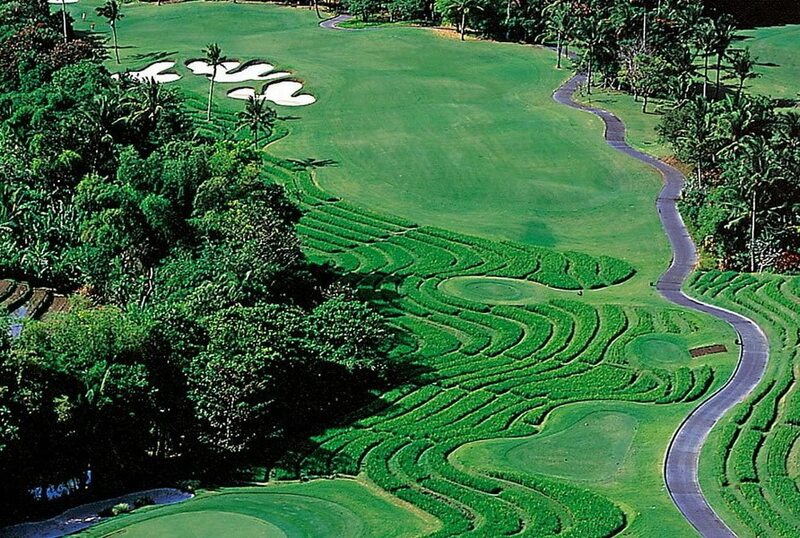 The golf course overlooks the Indian Ocean and weaves through rice terraces and towering palm trees. 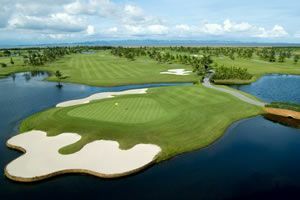 A 6805-yard par 72 championship golf course, it has been voted by Golf Digest and Asian Golf Monthly as the best golf course in Indonesia and best golf resort in Asia, respectively. Nirwana Bali&apos;s 18-hole golf course is one of the most photographed and challenging golf courses in the world. The breathtaking beauty of this course highlighted by terraced rice fields forming some of the rough and strategically placed bunkers. Three holes play atop the cliffs of the Indian Ocean with a famous Hindu temple protecting the course from the gods at sea. 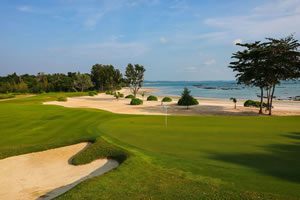 Hole 13 requires all a golfer&apos;s skill and concentration as it plays along Indian Ocean cliff tops. Hole 14 is a dramatic par-3, with the ocean thundering below. The long 441 yard par-4 5th hole is the most spectacular and challenging. You have to drive from elevated teeing ground across the valley to a saddle-shaped fairway, which has three fairway bunkers on the left side and the temple mentioned above on the right. A second shot to the right side of the green is required to avoid landing in the large greenside bunker and setting up for any chance of par. Nirwana Bali boasts a luxurious Balinese style clubhouse with a restaurant, a halfway house, a fully stocked pro shop, and exquisitely furnished locker rooms. Golf carts are compulsory and complimentary drink service is provided. 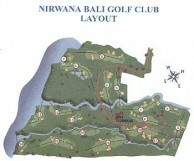 The Bali golf club also has a grass driving range, and full practice facilities are available to visiting Bali golfers. Have you played golf at the Nirwana Bali Golf Club and took some nice photos that you would like to share with other golfers? Send them to us and we may upload them here. Thank you in advance! Fantastic course. Extremely well maintained course, challenging design, bunkers very much in play throughout. Many holes require real thought, especially when laying up on par 5's. I can't say enough about this course. Definitely the course to play while in Bali. This is the best course on the island, it has some of the best views overlooking Tanah Lot. The course is always in great condition, manicured fairways and fast greens. The pro shop has the high end clothes and gear. This course is for the smarter player where you can position you drives on the fairway and make a lot of birdies. One of the most beautiful courses I have ever played. Some of the holes along the oean are breath taking. I have played 4 times and each time the course was in great shape. The only fault I had was it was a bit pricey.